Interesting cold sniff. I love apple cider fragrances in pretty much all forms and variations. 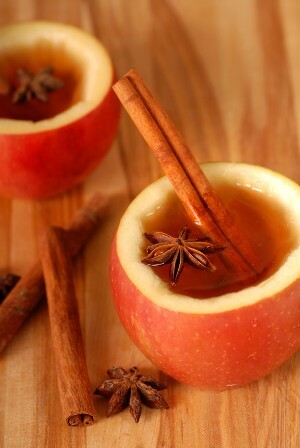 Apple and spice blend so perfectly together… it’s so warm and cozy! They’re usually room fillers too which I love. When I first smelled this clamshell, it remided me more of iced tea rather than an apple cider. It didn’t seem very spicy or apple’y which surprised me… apple is usually so strong. To me, this scent smelled exactly like an herbal tea. I liked it – it just wasn’t what I was expecting. I really enjoyed this fragrance – a lot! I melted a full clamshell pack in 2 electric melters in my great room (3 cubes in each melter) and it took all of 5 minutes to start smelling the aroma. The apple and spice really start to come alive once the wax gets hot. After a full night of melting this fragrance… I still say it smells like herbal tea more than apple cider. In spite of that, I LOVED IT!! It was different and not the average apple cider scent I’m used to. I’ll for sure buy this one again should I run across more. This is a very unique apple cider scent. Loved it!